What better way to celebrate Valentine’s Day than by getting away for a vacation with your sweetie. Especially if you live in a colder, northern region, you might enjoy a trip down south to Hilton Head, SC. Need some convincing to get your significant other on board? Let us help you out with these ideas. Nothing beats the nautical scenery you’ll find around Hilton Head Island, and the cruise industry has taken advantage of it. Check out Vagabond Cruises to get a fabulous tour of the island. Try a sunset tour for the best opportunity to catch a breathtaking view. Maybe you want to see if the island’s land scenery can top what you find out on the water. Whether you are an active cyclist trying to keep your heart pumping, or just a recreational rider looking to take your time absorbing nature’s beauty, Hilton Head offers 35 miles of bike trails to keep you busy for as long as you want to be. And we offer bicycle rentals so you don’t have to bring yours from home. Whatever your passion may be, Hilton Head likely has it for you. If your honey likes to shop, we’ve got plenty of name brand retail and boutiques to explore. If golfing is their thing, then you’ll find some of the best courses in the world. Just make sure that whatever activity you choose, it’s something you will both enjoy together. Hilton Head is known for golf but has so many other attractions to brag about. One of them is their restaurants. What date night hasn’t started with something delicious even before dessert? If you’ve already decided to take in the sights by boat, why not add some wine and dinner to make a completely romantic package. This could be the perfect option for those who would rather stay in instead of letting the wind or sea air breeze through their hair. Hilton Head is known for their fabulous cuisine. Whether it’s surf or turf that gets your appetite piqued, you have plenty to choose from on the island. Check out these sources for a list of the most romantic places to dine. Sometimes the best thing to do is nothing. Getting away to just spend your vacation in the room can be very relaxing… and romantic. Here’s a few of Hilton Head’s best hotels for accommodating lovebirds, and what makes them the best. A highlight of this resort is the pool with pool bar and hot tub. While the hotel is known for its hospitality, their “romance package” makes it a prime destination. The cleanliness and location of this hotel make it a perfect place to enjoy a beautiful view. The “romance package” at this resort join with its beauty to make it a top pick for a getaway for two. 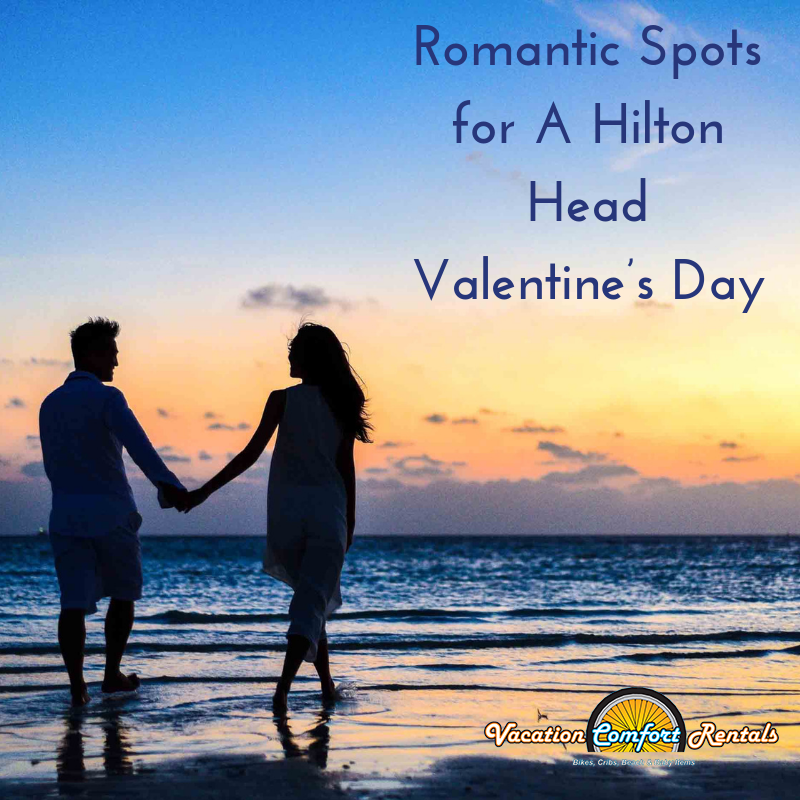 If you’ve decided to take your love to Hilton Head for a romantic getaway for Valentine’s Day, you won’t be sorry. If you haven’t decided to make this move yet, what’s stopping you?